Matthew D. Guarnere - "M.D.G." This 6 track EP is a very polished and professional package of retrorock music like it was played by the greats in the 70’s like Kansas, ELO, Cheap Trick and Supertramp. The production quality is excellent and Matthew wrote all of the songs and lyrics and plays all the drums and percussion, vocals and some guitar as well. The lead guitar is played by Ethan Porter, Jay Palermo and Mike Gallagher. Mike Ciranni adds acoustic guitar to one track. The vocals are very influenced by Steve Walsh of Kansas. The bio describes the songwriting skills of Matthew as unconventional and intriguing. This I would say, only if you never heard a rock record from the 70’s. The opening track, "A Little Chemistry", is a brilliant tribute to Kansas! "White Trash Wonder" is a totally different hard hitting 80’s style rocker including the approach to the vocals and the stunt guitar! "You Never Have To Grow Old" is a nice tribute to Freddy Mercury. The keyboards of Robert Scribble lay the foundation for the emotional vocals of Matthew. "Where’s Everybody Gone" is a acoustic ballad. "Chemistry Experiment" is a remix of the first track but the rock music has been removed leaving this empty shell of a great song. A bad idea. 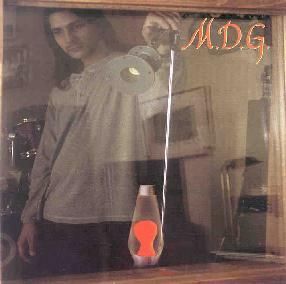 The last track, MDG record remix is a remix medley of the other three songs, with some extra programmed drums, edits, scratching and distractions. Another failed experiment in my eyes. I liked the trumpet. This is best described as a very well produced set of 4 songs of commercial rock music, with a retrorock feel but a 90’s production. For more information you can visit the Matthew Guarnere web site at: http://www.matthewdguarnere.com. Contact via snail mail c/o What's Real Unlimited; PO Box 42036; Rochester, NY 14604.